"Tennis Personal Checks" product is already in your cart. Personalized custom checks are an appealing way. You can employ such interesting personal checks to imbibe an informal entertainment or tone for the clients and customer. The Tennis personal checks are easy to use. There is space for the payee name, amount date and signature information. It is also a better option for any sports enthusiast. 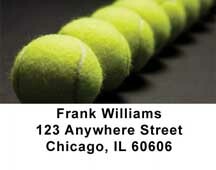 You can order address labels which would match with your personalized tailor made personal checks. Tennis personal checks can be a low cost addition to your company deals as well. It can promote your company image and draw considerable interest of the customer for your company services.